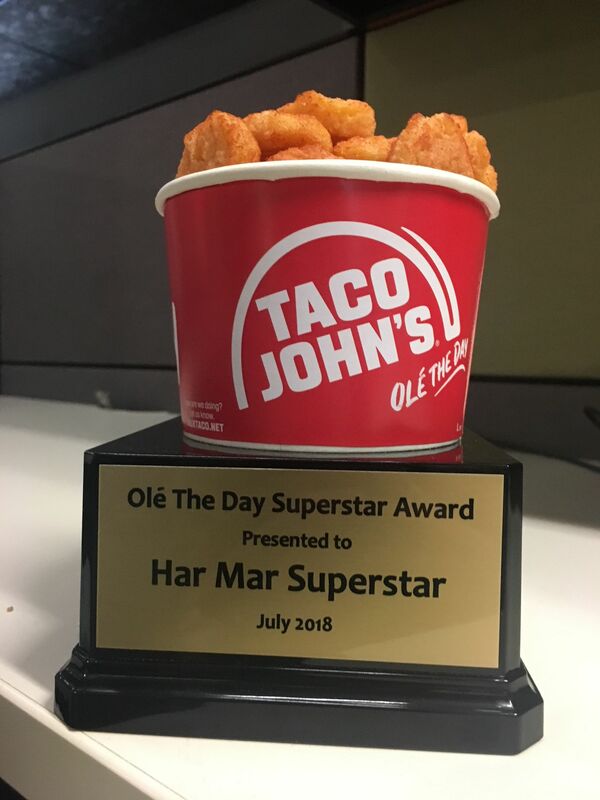 Just one hour before nationally acclaimed rhythm and blues singer Har Mar Superstar hits the stage at the Icon Lounge in Sioux Falls on Friday, July 27, the musician will be awarded the first-ever Potato Olés trophy in a ceremony at Taco John’s on 1100 S. Minnesota Ave.
With its fusion of distinctive flavors and south-of-the-border spices, the Taco John’s menu offers several signature items, including Meat and Potato Burritos, original Street Tacos and Potato Olés. Taco John’s features signiture specials like Taco Tuesday and discounted breakfast burritos on Wake Up Wednesday! Download the Rewards App and like Taco John’s Facebook page for exclusive deals.